If you’re in the process of organizing an exciting, fun-filled group tour of Toronto, Canada, simply continue reading to discover a few of Toronto’s must-visit sights and attractions. That your whole group will enjoy. And so you don’t have to wrestle with direction or Toronto traffic yourselves, your group can rent a Toronto school bus to shuttle you from one destination to the next, allowing you all to relax and enjoy the sites along the way. If you want to wow your group with stunning views of downtown Toronto, it’s well worth planning a trip to the CN Tower. Which stands at approximately 533 meters tall and features a glass floor, which members of your group can choose to walk across if they’re feeling particularly brave. If you feel peckish, during your visit to the CN Tower you’re in luck as the tower boasts a revolving restaurant. Which is well worth ticking off your bucket list. The distillery district is a chic neighborhood which is home to a wide variety of theaters, bars, and restaurants, which are housed inside genuine 19th-century buildings. So if you’re looking to visit a district which offers world-class nightlife and plenty of charm, it’s well worth visiting the distillery district on your first night in Toronto. Better yet, you’ll be able to freely walk down the district’s roads as the distillery district is only accessible by pedestrians and has banned all motor vehicles. 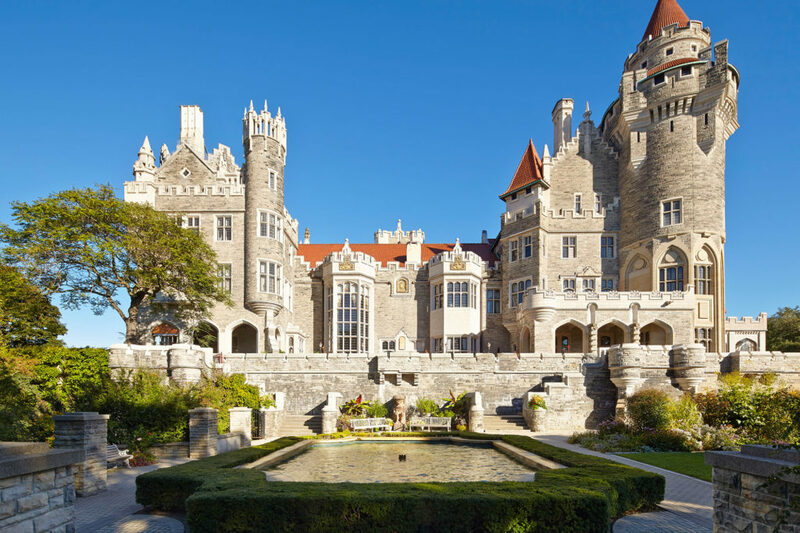 If you want to plan a visit to a site which you wouldn’t expect to find in Toronto, it’s a great idea to visit Casa Loma, which is an 18th century Gothic Revival style mansion, which looks just like a historic castle! Casa Loma is located in the middle of Toronto and was designed by the architect E. J. Lennox, who also happened to have designed many of the other grand buildings in Toronto and who is arguably one of Toronto’s most successful, most creative architects. The Royal Ontario Museum attracts over 1 million visitors each year which makes it the number one visited attraction in Toronto as well as the largest museum in Canada. It’s well worth visiting the Royal Ontario Museum as it features world culture exhibitions, dinosaur exhibitions, space exhibitions, costumes exhibitions and a variety of natural history exhibitions. So no matter what type of history the members of your group are most interested in viewing, you’ll be sure to be able to spend several hours exploring the Royal Ontario Museum. Furthermore, if you’re interested in learning about Canada’s interesting history, including the history of Canada’s native peoples, you’ll be able to find all the information you need, inside the Royal Ontario Museum. If you’re interested in architecture and would love to stroll around Toronto’s oldest district, it’s well worth planning a trip to Old Toronto. Where you’ll find the oldest church in Toronto and the St. Lawrence Marketplace. The latter of which offers a wide variety of boutique eateries as well as plenty of souvenir shops. Hopefully, after reading about five of Toronto’s must-visit destinations, you’re well on your way to planning out the perfect group tour of Toronto, Ontario!